There is nothing better on a scorching hot summer day than a glass of fresh, cold, homemade lemonade. Truth be told, our family makes fresh lemonade all year long. In the springtime, it’s almost as if we are willing Mother Nature to send summer our way early! I still remember the first time I had homemade lemonade. When I was a kid, my mom used to give us Kool-Aid lemonade drink, which I thought was good, until that first sip of REAL lemonade hit my lips. My parents were traveling, and I was spending a long weekend with a distant aunt. I remember being homesick and moping about the house on a warm summer afternoon. In an attempt to cheer me up, my aunt asked if I’d like a glass of lemonade. Once that sweet, sweet citrus flavor hit my lips, I was hooked. I’d honestly never tasted anything quite like it. It was sweet, cool, and hit every taste bud perfectly in my mouth. I quickly downed that first cup and asked for another. My aunt and uncle owned a farm, and they kept pre-made gallons of homemade lemonade in the garage refrigerator for the workers. With a good book to read, farm kittens to cuddle, and homemade lemonade in hand… I was in heaven for the rest of the weekend. I still smile thinking about that first sip of summer lemonade. Since then, I’ve passed my love of lemonade down to my two girls and now I’d like to share some of my homemade lemonade secrets with you! What I love about homemade lemonade is the simplicity. Below is THE BEST lemonade recipe, and it only requires three components. I’ll walk you through how to make lemonade below! When you love this summer drink as much as I do, you make it all year long. Every time I make homemade lemonade, I find a new way to simplify the process. The name doesn’t lie; simple syrup is not hard to make. If you skip this step in the drink recipe below, your homemade lemonade will be gritty. Here’s what you’re going to do — grab a small saucepan and warm one-cup of water and sugar over medium heat until dissolved. That’s it! I told you. SIMPLE. Set your simple syrup aside and move on to the next step! 2. Measure the fresh lemon juice. Fresh is best, but most of the time our families uses “fresh” lemon juice from Real Lemon (you can find it in the juice aisle). Just be sure to shake the lemon juice container before measuring, the pulp tends to settle. If you do want to roll with squeezing lemons, you’ll need between four and six to get the required cup of lemon juice for this homemade lemonade recipe! 3. Add the Ice, Ice, Baby. Many homemade lemonade recipes will call for water, but because we’re working with warm simple syrup we’re going to start with ice as our base. SAFETY NOTE: Because we’re playing with opposing temperatures in this recipe (warm/hot simple syrup and ice cubes), I recommend making this homemade lemonade in a plastic pitcher. If you have a glass pitcher, ensure your simple syrup is cool before moving forward. 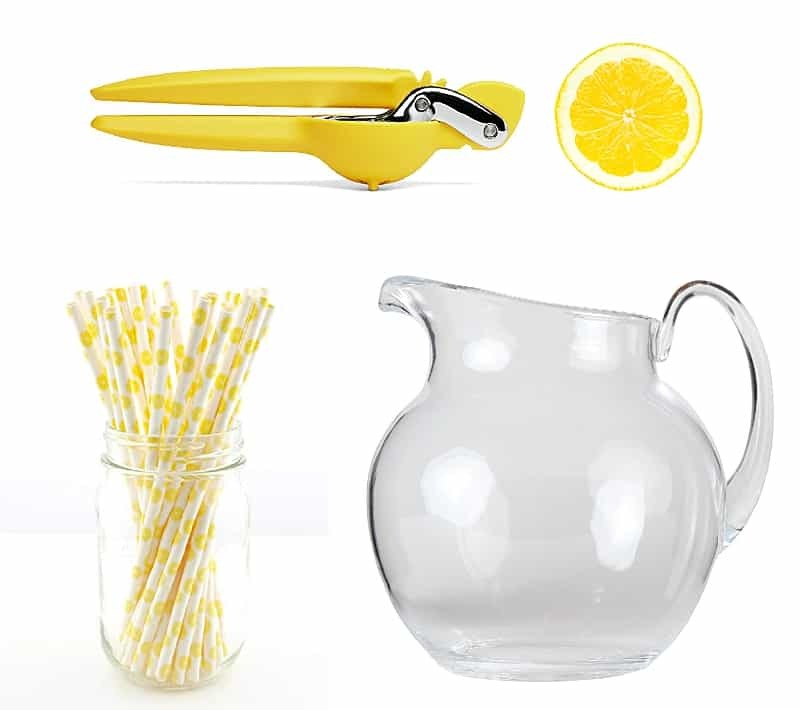 We have a lovely traditional lemonade pitcher that is shatterproof that we adore (find one here on Amazon). I swear homemade lemonade tastes better in one of these rounded pitchers with a straw. This post contains affiliate text and photo links. If you purchase something through the link, we may receive a small commission at no extra charge to you. At first, I was concerned about having an open-top pitcher for freshness in the fridge but, truth be told… we always finish ALL of the homemade lemonade when we make it. SO GOOD. You’ll want to start with two cups of ice in your serving pitcher when you pour in the lemon juice and simple syrup. Stir until cooled and combined. Add two to three cups of water; stir and taste test. If the lemonade is too sweet, add a dash of lemon juice. My kids love taste-testing the homemade lemonade to ensure it is just right! QUICK PARENTING TIP: If you have a kiddo who swears they love their homemade lemonade SUPER SOUR, pour a glass from the pitcher and let them do their individual taste testing. It is as easy as 1-2-3. 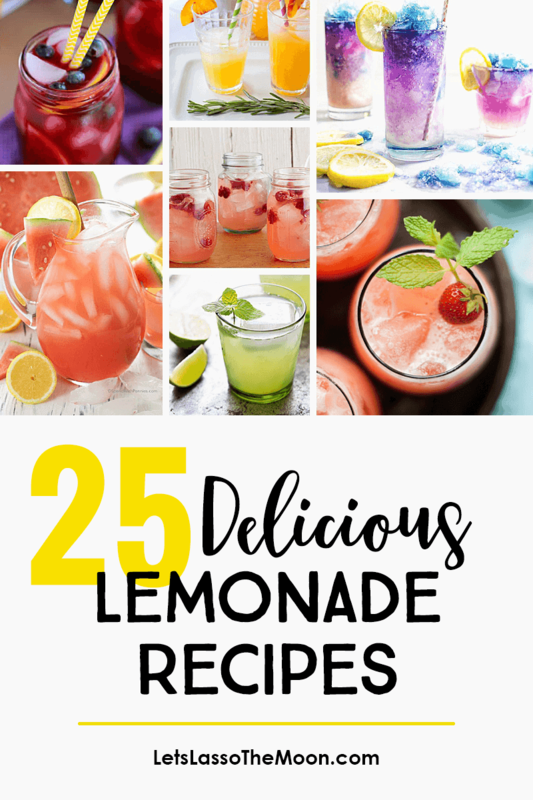 Here’s a printable copy of the homemade lemonade recipe above! This homemade lemonade is THE BEST. Combine 1 cup of white granulated sugar and 1 cup of water in a small saucepan over medium heat. Stir until the sugar is dissolved. Set your completed "Simple Syrup" aside. Measure 1 cup of fresh lemon juice (if squeezed, approximately 4 to 6 lemons). Add 2 cups of ice cubes to your plastic serving pitcher. Pour in the simple syrup and lemon juice; stir until cool and combined. Add 2 to 3 cups of water; stir and taste test. If the homemade lemonade is too sweet, add a dash of additional lemon juice. In my mind, the first taste of freshly made summertime lemonade signals that summer has officially started. Now that my kids have the basic recipe down, we’re excited to play. The above recipe works great in a blender if you want a homemade lemonade slushy. This summer though, we’re going to try a couple of unique lemonade twists. Here is our must-try lemonade recipes list! Galaxy Lemonade <— How cool is this?!? 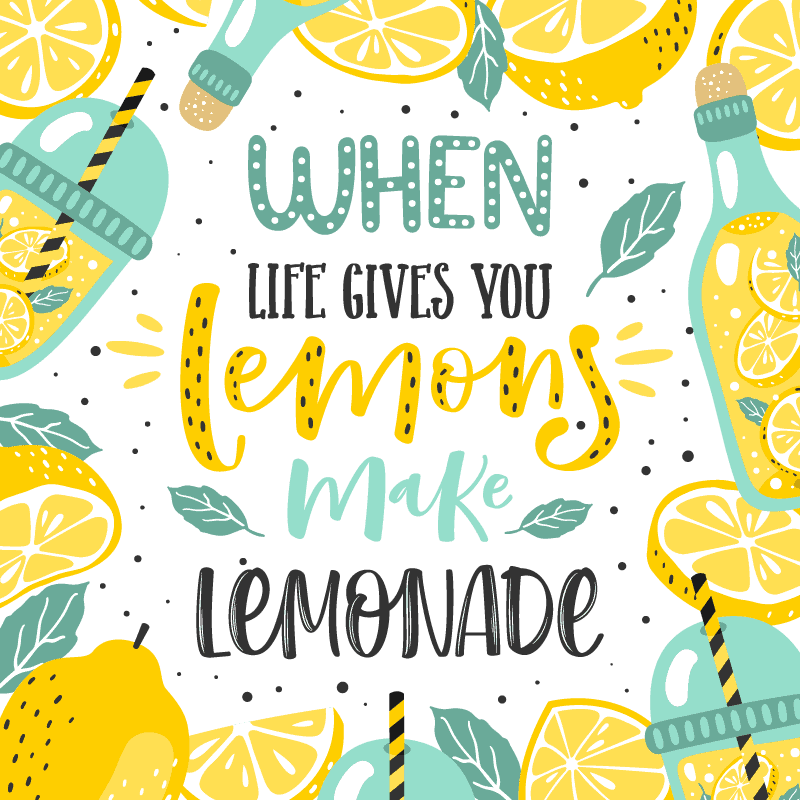 Honestly, drinking homemade lemonade is like having a glass of sunshine, no matter what time of the year it is! May you find yourself with a sweet glass of lemonade in hand… and if you’re lucky, as I daydream of my aunt’s farm, you’ll have a good book on your lap, too. P.S. When my girls were little, they always hosted lemonade stands at our community rummage in the summer. My husband suggested being frugal and serving Koolaid Lemonade Drink. I couldn’t bring myself to serve that to people! Instead, we made homemade lemonade but charged a dollar a cup to ensure a good profit margin. The girls always seemed perplexed by their response, but it always makes me smile. There truly is nothing like a glass of ice-cold homemade lemonade on a hot day. Plus, how could anyone resist that cuteness? Pin this collection of homemade lemonade recipes for later!